I have a soft spot in my heart for martini bars. I've been a prissy you know what about drinks since I started drinking (after my 21st birthday, thankyouverymuch), and I love me a good martini. Heck, I even love a bad martini sometimes. In the early days of my martini drinking, when I worked full time at a music store and went to college full time, I used to go to a bar called ZaZa. It was located in the now demolished Cedar Center shopping plaza in South Euclid and had $5 martini nights on Thursdays. I would drink as many appletinis as I could stomach and always waited to close my tab out after midnight, once my Friday paycheck had been direct deposited into my account. Oh, those were the days. I'd heard from a friend that Paragon in Euclid could be a possible location for the festivities, so my boyfriend and I stopped for a pre dinner drink the other night. I know some people look down their noses at Euclid. It's no culinary hotspot, but I've had many a fun night there. And I could see myself having a fun night at Paragon, although it's not quite the right venue for my birthday party. 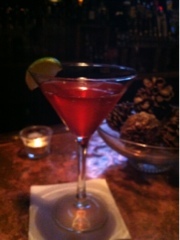 To me, Paragon is a nice neighborhood bar that happens to have an extensive wine and martini list. There's a really nice bar and multiple tvs that are larger than my car. There's neat Cleveland artwork on the walls and an exposed brick encased dining room offers a sunny contrast to the dark (and a little smelly) bar area. People seemed to be flocking in for their burger night, and I've heard that the chef - Jeremy Esterly - formerly of Dim and Den Sum - has been creating some really inventive food. My drink was stong but smooth, and had it not been for the funky smell coming from behind the bar, we might have stayed for another drink. (I'm guessing some fruit went bad?) And I do hope we get to go back to try out some of their grub. We'll just be sure to sit somwhere besides at the bar. So I ask you, dear readers, where should I have my birthday party? I spent more than my mortgage for my 30th, and I'm not looking for a repeat of that this year. (although having a fully catered vegetarian buffet and all you can eat dessert was pretty awesome) Where can I go for a good stong drink, a nice atmosphere, and some decent vegetarian food with about 20 of my closest friends? East or west. Euclid seems like a nice place. I'd love to visit Euclid to experience different beach clubs. This is the right place to enjoy and unwind all at the same time. I'd been to Euclid and I really enjoyed the place. The Beach clubs inside Euclid are just awesome. I'm planning to visit it again next year.